Mirror mirror on the wall, who's birthday is coming this Fall?! 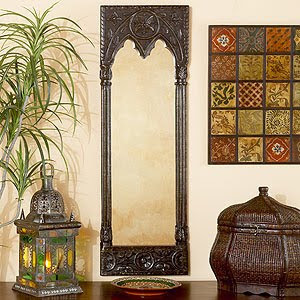 This mirror from Cost Plus World Market is at the top of my birthday wish list, so hopefully my family and friends are reading this ;) It's hand carved from India, and absolutely gorgeous in person! I hope they are reading it too, gorgeous mirror. Good idea my birthday is soon too hummm need to post my wishes. Oh, that mirror is a gem! I would love to look at my own image every morning in it! My apartment came with built in mirrors in some of the doors, so out of laziness I am using those.... they are kind of old fashioned looking but no where near this piece! oh wow, that mirror is gorgeous! I love mirrors, this is a honey.